The place is called Tokyo Ramen Oban Sakuragawa, but the name itself really doesn’t matter. 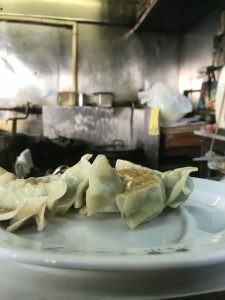 It is a small shop, mainly counter-space, selling soy ramen and a handful of Chinese dishes — gyoza, sliced pork with ginger, beef with peppers, stir-fried bean sprouts. Prices are super cheap ($7 or so for a lunch “set”). Grizzled regulars and young students haunt the stools, the elders holding court with racing forms, newspapers and more than a few glasses of sake or beer. The kitchen itself is spartan, an enormous, simmering vat of broth, another for cooking noodles and blanching vegetables. Fully carbonized, ancient gas jets send powerful flames to woks that sizzle away with fried rice and perfectly crisping gyoza. Like an old smokehouse, there is a patina of heat, of vaporized cooking oil, of work and sweat that fills the entire space. Everything is gerry-rigged by experience, hundreds of tiny repairs made of necessity, the stainless steel heat-guards dimpled with the scars of endless scouring brushes and dinged pots. Make no mistake, I’m not saying it is dirty — it would pass a health inspection in a heartbeat — but there can be no doubt that hundreds of thousands of dishes have been cooked here and the whole place would probably topple over if ever there was an attempt at renovation. Extra egg cartons sit on the counter corners, gallon cans of soy sauce under a bench and hundreds of “lost” Manga books line a shelf at knee level. 16 years ago, on my first visit to Japan, I ate ramen here. The chef was an older Chinese woman with thighs so powerful I could imagine her making the Long March right alongside Chairman Mao himself. Across the street there was another ramen shop, serving what was then, the spiciest ramen in Tokyo. There was a rumor that an 8-year-old boy had to be rushed to the hospital after eating there and fittingly there was a line down the block of risk-taking noodle lovers. The Chinese chef betrayed no jealousy about the competition as she served me a bowl of ramen that had no fan-fare, no rumors, no gimmicks. It was deeply garlicky, rich with chicken and pork fat and hints of white pepper and ginger. The slices of pork were perfect. I poured myself a glass of cold water from a worn plastic jug, blew my nose and drank the broth down to the bottom. 16 years later, the owners may have changed — there were two older women who now ran the spot. The ramen, however, remains exactly the same. A perfectly soul-satisfying bowl served piping hot on a brisk day. It is not the best ramen in the world, but it somehow encapsulates the essence of Ramen for me: cheap, unpretentious, satisfying, made with pride and served up by small business owners who are a part of their community. As I said earlier, whether I was eating at Tokyo Ramen Oban Sakuragawa or not, doesn’t really matter. 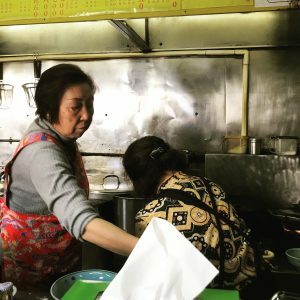 There are hundreds of similar restaurants around Tokyo, some clearly stating they are Ramen spots and some just advertising themselves as Chinese. They remind me of the old school NY coffee shops that are slowly disappearing. Places you went to for a chicken salad sandwich on rye that was better than expected or a softly scrambled egg with crispy bacon that always hit the right marks. These are the places that you return to over and over, because they exist within the confines of their own history. They don’t aspire to be anything other than what they are and in that simple fact, they provide a certain relief from the challenges of simply living in an ever-changing world.